So you’ve read our article on core bond funds and are ready to choose one for yourself. How do you choose the right fund from the thousands of available options? Step 1: Passive vs. Active Core Bond Funds? There are two types of core bond funds. Those that are passively managed which are also referred to as “Index Funds”, and those that are actively managed. The goal of a passively managed bond fund is to match the performance of an index as closely as possible. 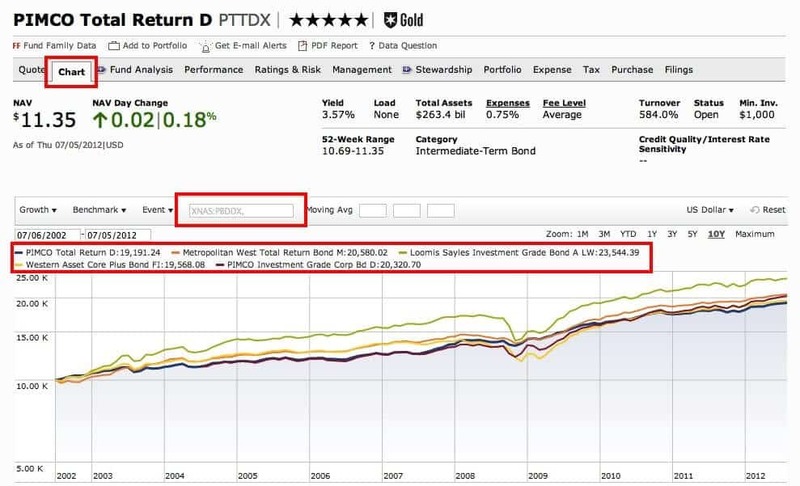 The goal of an actively managed bond fund is to beat the performance of an index. If you are not sure which type of fund is right for your situation, read our article on passive vs. active bond funds. Step 2: Core Bond ETFs or Core Bond Bond Mutual Funds? With the one big exception of PIMCO’s ETF (Ticker: BOND), the large majority of popular Bond ETFs are passively managed. With this in mind if you want an actively managed fund you are most likely going to need to go the bond mutual fund route. If you have decided that passively managed core bond funds are the best option read our article “Bond Mutual Funds vs. Bond ETFs” to decide whether a Bond ETF or Bond Index Mutual fund is best for your situation. Step 3: Decide How Much Interest Rate Risk You Want to Take? Generally, the longer the bonds that your core bond fund holds have until maturity, the higher the yield on the fund. However, what you trade for that higher yield is greater volatility as interest rates change. For how to decide how much interest rate risk you are willing to take, read our article on Bond Fund Interest Rate Risk. Step 4: How Much Credit Risk do You Want to Take? Credit risk is the likelihood that some of the bonds your core bond fund invests in will default. The more credit risk a bond fund takes, the higher both its potential return and the volatility of those returns. Our opinion at Learn Bonds is the potential for extra return with a mix of both government, corporate and other types of investment grade bonds is worth the extra credit risk over a government only bond fund. The key with core bond funds is to make sure you do not stray too far out on the credit risk spectrum, such as funds that have high percentage of assets in high-yield or lower investment grade debt. For more on credit risk see our article on bond fund credit risk. This step is best explained with an example. Lets say I have gone through the steps above and decided on an Actively Managed Intermediate Term Bond Mutual Fund. I have $10,000 to allocate to a core bond fund initially. 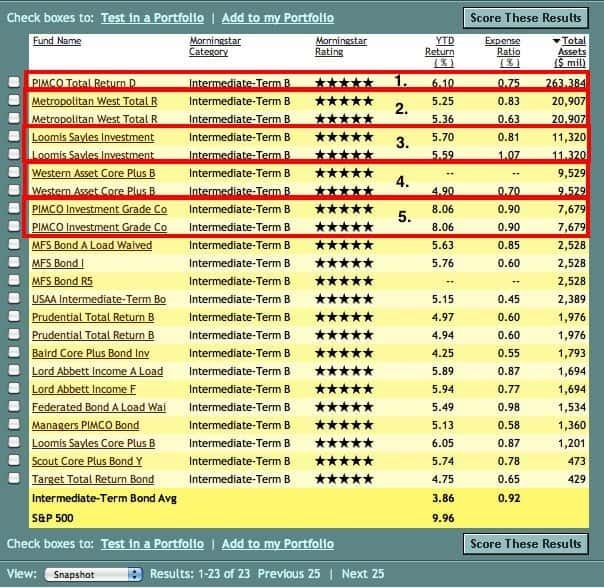 For a full explanation of each of the sections and why we choose the settings we choose, see our article on setting up a bond mutual fund screener. 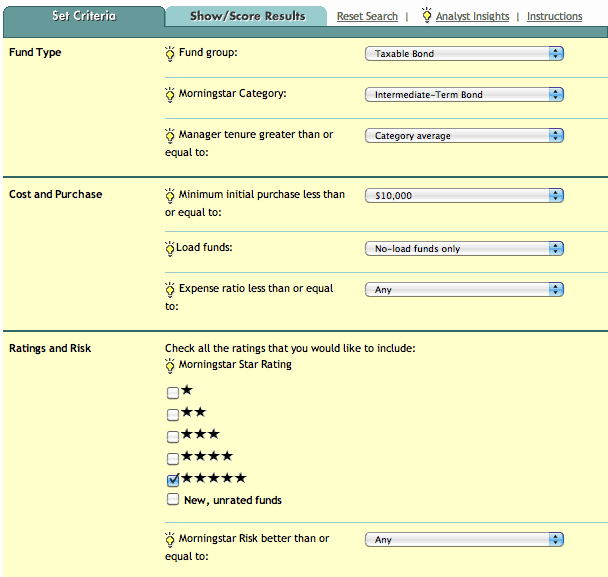 Below is a screenshot of the core bond funds that come back after we hit the show results button at the bottom of the above screen. 1. 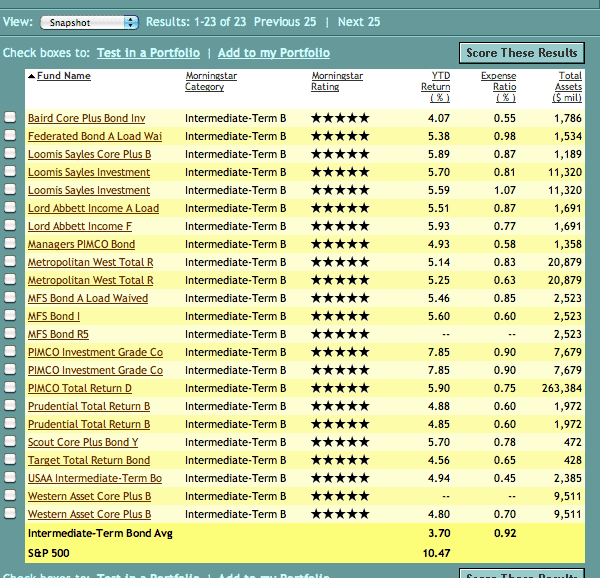 The screener returned 23 core bond funds which is way too many for a short list. We are looking for 3 to 5 funds. 2. Some funds show up in the list multiple times. This is because of the different share classes offered by the fund. If you don’t know what this is read our article on share classes. A good criteria to use when you have too many 5 star rated funds (a good problem to have) is fund size. 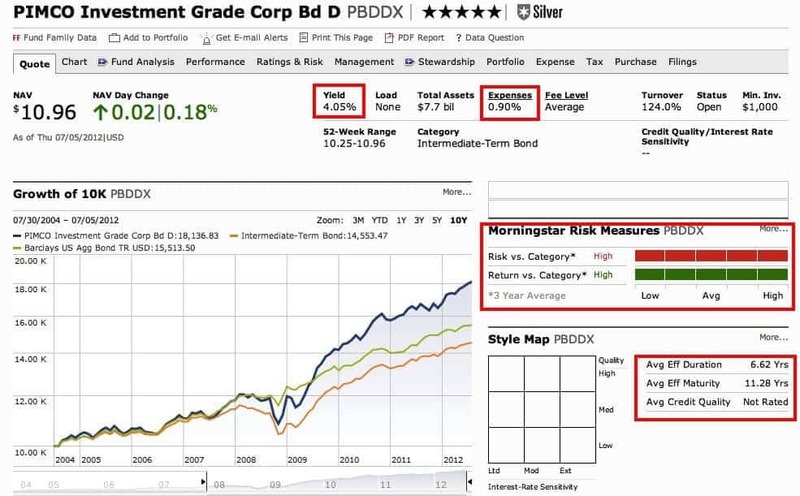 If a fund is rated 5 stars by Morningstar and one of the biggest funds on the list, that likely means that the funds has been vetted by more people than a smaller fund which is generally a good sign. I have highlighted the top 5 core bond funds with red boxes. Inside the red boxes you will see different share classes of the same fund. You can identify that these are different share classes of the the same fund because of the name similarities, and because they show the exact same amount for assets under management. The assets under management is the total for all share classes of the same fund. I have highlighted in red where you can find the investment minimum, expense ratio, and ticker for the fund (each share class has its own ticker). As you can see from the first screenshot above the share class with the $2500 minimum has an expense ratio of .83%. In the second screenshot we can see that the share class with the $5000 minimum has an expense ratio of .63%. Since we have $10,000 to invest we want to go with the second option with the lower fees, so I am going to write that ticker down. What do I like about this core bond fund? It was the top performer on my shortlist by a wide margin historically. It has the highest yield of any fund on my list. Its average Eff. Duration (interest rate risk) is on the low end for a Intermediate term fund. What do I dislike about this fund? While the comparative returns are great against its category and the funds on my shortlist, the fund takes a large amount of risk. The risk versus category box highlighted in red indicates the level of risk compared to its category is high. Its average credit quality is on the low end of investment grade, so it is taking a lot of credit risk relative to some of the other funds on my list. It has the lowest expense ratio of any of the funds on my list. Its risk vs. category is not quite as high as some of the other funds on my list. Its average credit quality is BB which is below investment grade. It is taking a lot of credit risk. Its expense ratio is below average. 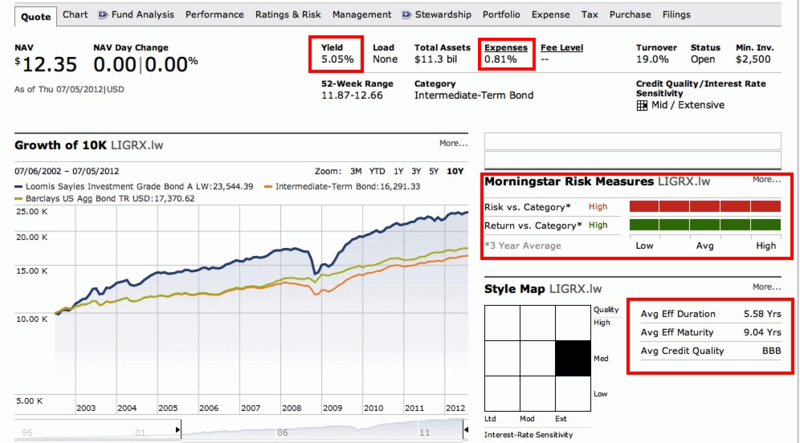 I don’t know what the credit quality of the fund is as morningstar does not have it listed. 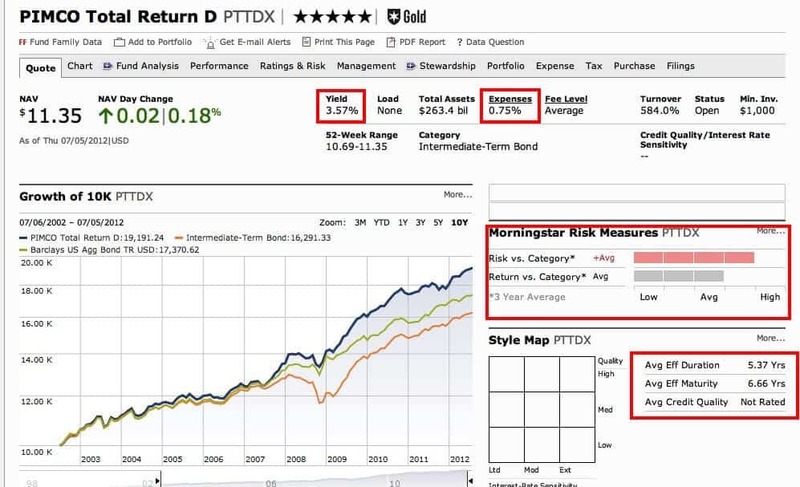 It is taking more risk than its category to achieve returns that are average for the category. Lower than average expense ratio. Above average returns vs. category. Average Effective Duration is on the low end so interest rate sensitive is moderate. Credit quality is AAA, it is investing primarily in the highest rated bonds. Its has the lowest yield of all the funds listed. Its returns vs. the category are on the high end. The average credit quality is not rated. Its average Effective Duration is the highest of all the funds. This is a fund that has a lot of credit and interest rate risk. The expense ratio of the fund is at the high end of the range. Now that I have gone through all the funds on my shortlist I can choose my fund. In this case I am going to eliminate 3 of the 5 funds right out of the gate. The two PIMCO funds do not have enough information on credit risk in order for me to make an informed decision, so they are out. 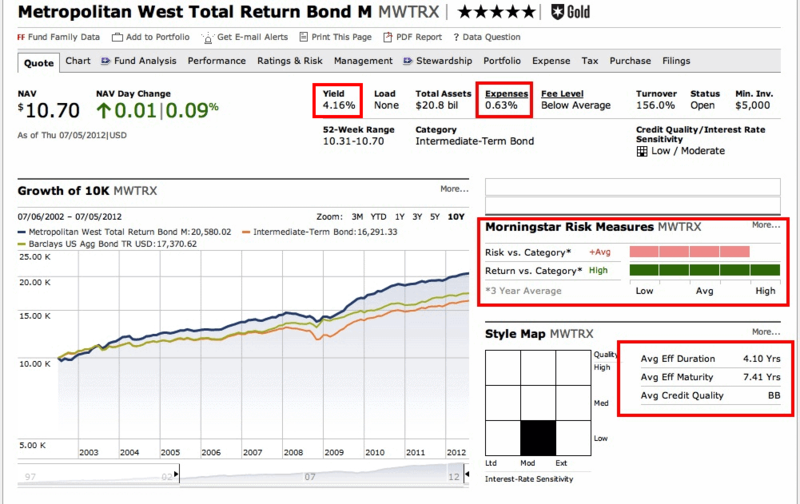 The Metropolitan West Total Return is investing in below investment grade bonds. I am looking for investment grade funds so they are out as well. This still leaves me with two good funds to choose from however which are the Loomis Sayles Investment Grade Bond A LW LIGRX.lw and The Western Asset Core Bond FI WACIX. These are two nice options to be left with as they are both top performing Intermediate Term Bond Funds. However, the primary difference is clear: The Loomis Fund is taking more credit risk and more interest rate risk to generate its higher total return and yield. As the core bond fund is meant to be an anchor fund for my portfolio there is an argument to be made for going with the “safer” Western Asset Fund. However in this instance since the Loomis fund is still investing in investment grade bonds, and its interest rate risk is not that much higher than the Western asset fund. 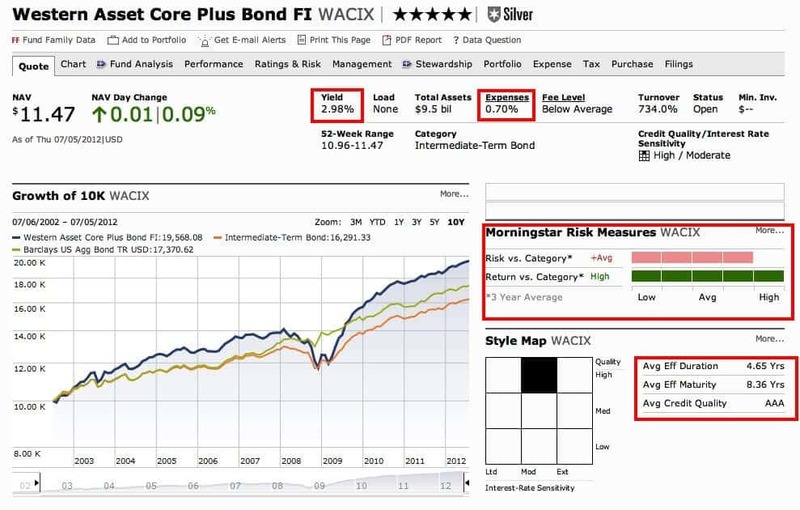 To me, the extra risk is in my opinion worth the extra return.So, I have just used the Learn Bonds 8 Steps to choosing a core bond fund to choose my fund:The Loomis Sayles Investment Grade Bond A LW LIGRX.lwStill having problems choosing your core bond fund or have a question that wasn’t addressed? Hit us up in the comments section. For more information on bond mutual funds and ETFs visit the bond funds section here at Learn Bonds.